Oh. My. GOD. 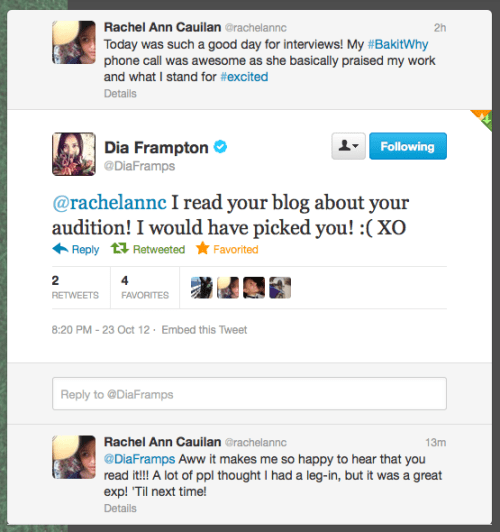 Did Dia Frampton really just tweet this to me?!?!? How did she get word?! What a sweet gal to take her time out to read it. And what a sweet group of people in general to be so connected to their fans! I think now would be an appropriate time to, in a way, reflect on why exactly it is I’ve been an avid supporter of Meg & Dia for so long. In the beginning, as the young, quiet, shy and reserved Catholic 12-year-old schoolgirl I was who was yet to find her voice, yet found comfort in blogging and cultural dancing, playing guitar did something new to me. I found a connection to it that nothing else in the world has ever come close to, giving me a sense of pleasure…of being…of heartache…of stillness…in sound (where music can hit you “here, here, and here–your heart, mind, and ears”). Meg and Dia Frampton were, in a way, those “older sister” kind of figures to me. As any fan of the band, one can easily discover how good-natured, sweet, and well-behaved these girls were, no matter how weird, kooky, or strange they could be on the side. But, aside from that, they are extremely well-read, as they find comfort in reading old classic novels on tour; they journal and write constantly; and, they love music and love to rock out. For once, I found two girls who connected on the same wavelength to me. Their habits were similar to mine. Our interests were generally the same. We came from small towns, wanting more out of it, reveling our voices in writing (or, songwriting for their part). And, they were all-in-all such great models for me to look up to… as a girl with a lot to say, a lot on her mind, and nobody holding her back but herself. Have you ever had some sort of special memento or key to your past that just unlocked and triggered all these memories and emotions you felt at a specific moment in your life? Or have you ever had some significant figure in your life that really left an imprint on your life, or your heart? That is what Meg & Dia has done for me … their music really triggered something in me. With no absolute idea or direction of what I wanted to pursue, or what I wanted to do with my life, or even what my own hobbies and interests were beyond scoring good grades and staying home playing video games with my brothers, their music, their words, and their voices truly spoke to me. They gave me light. They gave me wisdom. They gave me an understanding of why I felt the way I did. They made me feel less alone. They made me realize my love for English. They made me believe that my thoughts were above anyone else’s. They helped me tap into my untapped potentials. They uplifted my spirits and encouraged me to just be me at times I felt so insecure of myself. And—they let me have a purpose. (…) They have given me total realization of my own natural talent, ability, and vehicle for self-expression in music and writing when I picked up the guitar, and didn’t plan on putting it down. (…) When you come across some old memory or item or token to your past (or, in this case, each and every Meg & Dia song for me), you remember why exactly you are where you are. Whether it’s Home or a simple memory, coming back to it and embracing all it was and still is will help you come to terms with your true self. You’ll remember why it was so important to you, or why it may even have hurt you so much. You’ll remember the emotions you felt—whether you feel it again or not—and you’ll remember how far you’ve come since then. How much you’ve grown. And why you’re going the way you are going. They are a way of finding inspiration when I need it. They remind me of why it is I’ve loved what I’ve loved for so long… Of why I love playing the guitar so much, and why I love to write. Coming back to terms of where I came from with all of my professional goals, it is easy to see that these two girls contributed a whole lot to getting to the point where I am today… Even as I start to “make waves” with new writing internships, performance gigs, and cultural dance boards, I cannot quite wholly forget where all this exactly came from. Where this love for all of this came from. Because, even as I try to “let go” of my love for the band, I can’t quite let go completely… That would be forgetting where I came from. And that would be a disastrous thing. To not write, to not make music, to not have my guitar… There would be no reason for my living. To rid of your art is to rid of your voice. As I live my own life, and they live theirs, with boys crooning at our every moves as we laugh and dance and sing away, we will continue to do our art. Because, like the birds we “ring like bells in the night… Who will be our lovers?” Who will take up our art–our voices–our consumptions for love? Warriors for love. Let us find happiness in that.